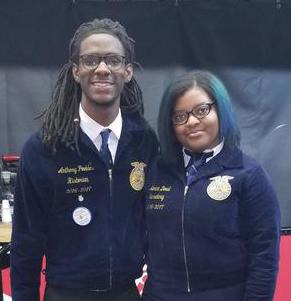 Due to their hard work and dedication, our FFA President and Vice President, Anthony Peebles and Monica Dowd, successully met all the requirements and were honored at the state FFA convention. 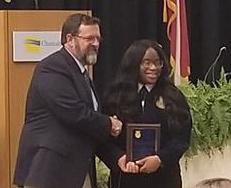 Also, our former President, Irene Igbere won 2nd place in Agricultural Communications Proficiency. Proficiency awards are granted to FFA members who have excelled in their Supervised Agricultural Experience (SAE), worked over 750 hours and completed other FFA requirements. Our graduating members also received academic scholarships for their participation in FFA and in the agriculture pathway. 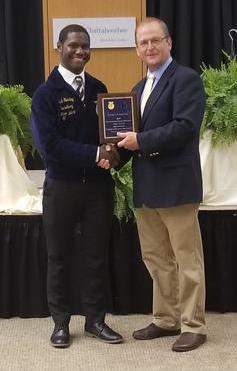 Anthony Peebles won $2,500 from the National FFA organization to study Environmental Engineering. Lindsay Corbin won over $42,000 to attend Fort Valley State University and will major in Veterinary Technology and Isaiah Teasley won a full scholarship to attend Benedict College. He will major in Environmental Engineering as well. Congratulations to all!